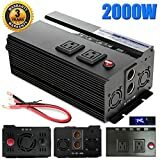 A power inverter is used to convert direct current (DC), as from a car battery, to alternating current (AC), which is what is used to run your household appliances. For example, if there is a power outage in your house, you can use an inverter to hook up your truck or car battery to run your refrigerator on battery power, so your food won't go bad. It can also be employed in running a heater or a pump. Or, if you are traveling in a recreational vehicle or boat, an inverter will help you run your refrigerator or stove while camping. Classified by input voltage: There are inverters that take 12 Volt and 24 Volt battery inputs. (A car battery is typically 12 Volts.) Just make sure that your inverter matches the battery's voltage: a 12 Volt car battery will need a 12 Volt inverter. Compact/Lightweight inverters: These are used in cars and vans, to power a laptop, mobile phone, or camera. Heavy-duty inverters: These are used in trucks, boats, and recreational vehicles. They can be used to power televisions, kitchen appliances, and electronics. Inverter/chargers: These are used in mobile homes, or when you require emergency power in your home for extended periods of time. The more batteries that are hooked up to the inverter/charger, the more time your appliances will run. These can supply electricity to refrigerators and power equipment. They also charge the batteries while in use, like an uninterruptible power supply (UPS). 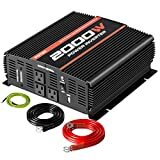 Beware the initial power surge: One customer bought an inverter that is rated for 275 Watts, hoping to use it when they lost power as a result of a tornado. Unfortunately, the refrigerator/freezer required an initial surge of 705 Watts, which then drops to 205 Watts of continuous power. So a 1000W power inverter will do the trick here. 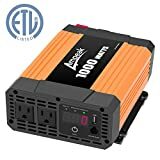 Fraction of the price of a generator: The Bestek power inverter is around $90, and is good for short power outages; a generator can go for as much as $1000. It all depends on the amount of time you can expect to be without power. 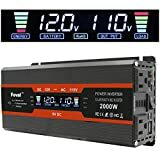 LCD display on the device: The Krieger 1100 Watt power inverter has a nice feature, in that it has an LCD readout of how much the battery is charged, as well as input voltage and output wattage. This way, you can keep an eye on whether you have exceeded the inverter's tolerances. Determining the load: You can decide what type of inverter you need by the amount of power (in Watts) that you require at any one time. This is called the load. You can't expect to run air conditioning (which typically requires 900 Watts) on an inverter for more than a few hours, since it will drain the battery. (You'd probably need a generator in that case.) On the other hand, you can run lights for a long time, since even long fluorescent light typically consume only 40 Watts of power. Watts vs. Volt-Amperes (= VA): Electrical power is expressed in the familiar unit of Watts (= voltage times current). Voltage is measured in Volts, while current in measured in Amperes. So Watts should be the same as Volt-Amperes. But it isn't: The power in Watts equals the power in Volt-Amperes, minus the losses due to the appliance's (in)efficiency. If there were no power losses due to heat, for example, then the efficiency of the appliance would be 100%. An inverter will be rated in Voltage-Amperes, or VA. Appliances like refrigerators and stoves will be rated in Watts. A person should assume that the power inverter will produce 60% of the VA rating that it is given, to be safe. Sine wave inverters/Modified sine wave inverters: Appliances that run on Alternating Current receive a 50 cycle/second pure sine wave. At first modified sine wave, inverters would take direct current from a battery and try to match the sine wave, by producing a square wave. But because a square wave is a rough approximation to a sine wave, it lead to heavy energy losses, and could even damage equipment. So the best inverters are those that produce a sine wave, or modified sine wave, output. That will produce less noise and heat, and will extend the life of your appliances considerably. If you want to power sensitive electronics, such as computers and network equipment, you'll want a sine wave inverter, to avoid damaging your equipment. Peak power/continuous power: Appliances and fluorescent bulbs will require more power to get started, but then they run on a continuous amount of power which is much less. You'll see this marked on the inverter as “peak power” (the maximum power required) and “continuous power”. 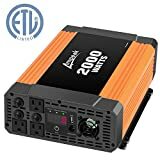 Inputs and outputs: The Bestek 1000 Watt Dual AC power inverter takes 12 V from your car battery and converts it to 110 V alternating current, which is standard wall current in the United States. It has a jack that can be inserted into the car's cigarette lighter, or you can use battery clamps to get voltage from the car battery. You then plug in your appliances into the inverter, and you're all set. It will run a laptop, a TV, a DVD player, a microwave, and more. Bestek—was founded in 2007, and they are located in Shenzhen, China, even though they have offices in the US, United Kingdom, and Japan. 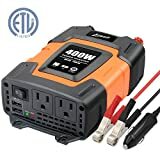 They manufacture power inverters, jump starters, travel converters, and a variety of chargers. Energizer—started with W.H. Lawrence in 1896. 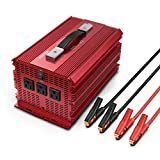 Their original product was the Eveready battery, but they have expanded considerably, and now make power inverters, battery chargers, booster cables, and jump starters. Their corporate office is in Fort Lauderdale, Florida. Krieger—are leaders in solar energy solutions. They make plug adapters, power inverters, surge protectors, jump starters, transformers as well as solar power equipment. Their corporate office is in Fort Lauderdale, Florida. PowerBright—is a maker of power inverters. They make 12 V and 24 V DC-to-AC power inverters, in pure and modified sine waves, as well as step up and step down transformers. Their corporate office is located in Fort Lauderdale, Florida.